How Long Should Technical Writing Take? | Writing Assistance, Inc. Writing Assistance, Inc.
How Long Should Technical Writing Take? While every technical writer has to deal with deadlines, the truth is that good, accurate and useful documentation takes time – and it should. Longer deadlines allow the writer to do the research necessary before writing. And, of course, they help when the writer is actually in the process of writing the documentation. But the market often asks for rush work to be done, setting up a myriad of troubles. Can’t complete adequate research – Even if the research is started, complex documentation can require substantial research. The writer may need to talk to current users of the product or the designers/producers of the product to ensure information is conveyed accurately. Doesn’t have time for important feedback – Because documentation needs time for review – and often testing – shorter deadlines can lead to skipping this process, and skipping the opportunity to have proper revisions completed. 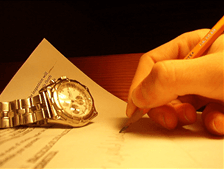 May skip over finer details – When a writer is rushed, he or she might skip over details without realizing it. Might have more revisions to make in the future – If the documentation isn’t right the first time, it may require additional work and additional revisions, often at a cost to the client or user who needs the documentation. We all need more time in every day, but when working with a technical writer, giving them plenty of time allows them to create the documentation that can be used effectively. Rushing through the documentation process – usually encouraged by those who don’t fully understand its importance – can result in frustrated users and customers as well as an increased burden on customer service and technical support personnel who will ultimately have to deal with the fallout from poorly prepared documentation. Thanks for taking the time to comment, Lisa. Couldn’t agree more!